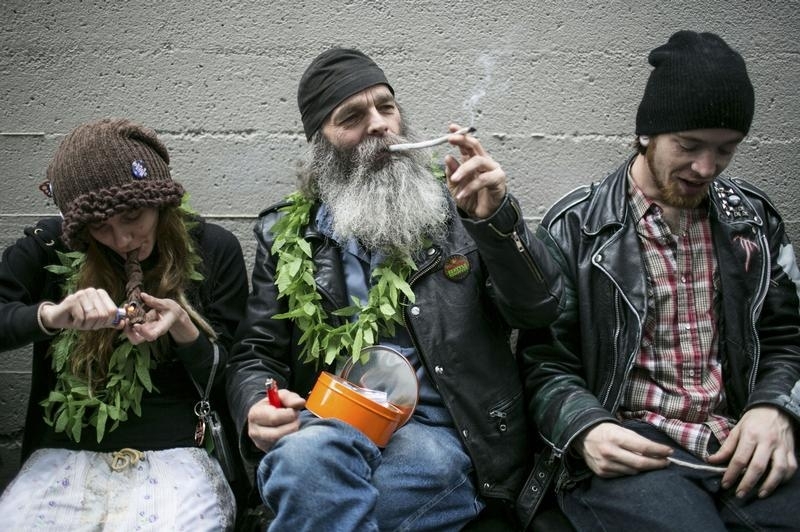 Hu Barney (C), smokes a joint during 420Fest at the Luxe Nightclub in Seattle, Washington April 20, 2013. Canadians who work in, invest in or patronize the cannabis industry could face being banned for life from entering the United States, a border official told Politico in an article published on Sept. 13. Recreational cannabis will become legal in Canada on Oct. 17. It has been legalized in nine U.S. states and Washington, D.C., but remains illegal at a federal level. An exchange-traded fund tracking cannabis producers in Canada closed with a market capitalization of more than C$1 billion on Sept. 4. The Horizons Marijuana Life Sciences Index ETF has risen by 134 percent in the past year.